This time round I think we have outdone ourselves! 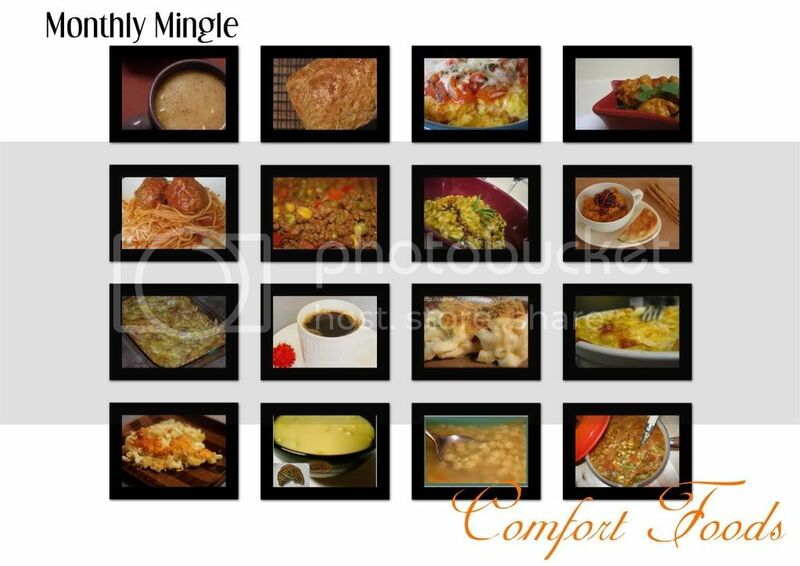 I invited you this time to join me at the mingle with your favorite comfort foods and you all came with baskets full of steaming soups, pasta, rice and so much more. I was overwhelmed by the 90+ entries and excited to see what comfort foods you all enjoyed. But as always let's just take a minute to check out the new theme for February! Well after all these comfort foods that make us feel good from the inside, I thought it would be quite nice to have a get-together here we prepare simple food made in one pot. 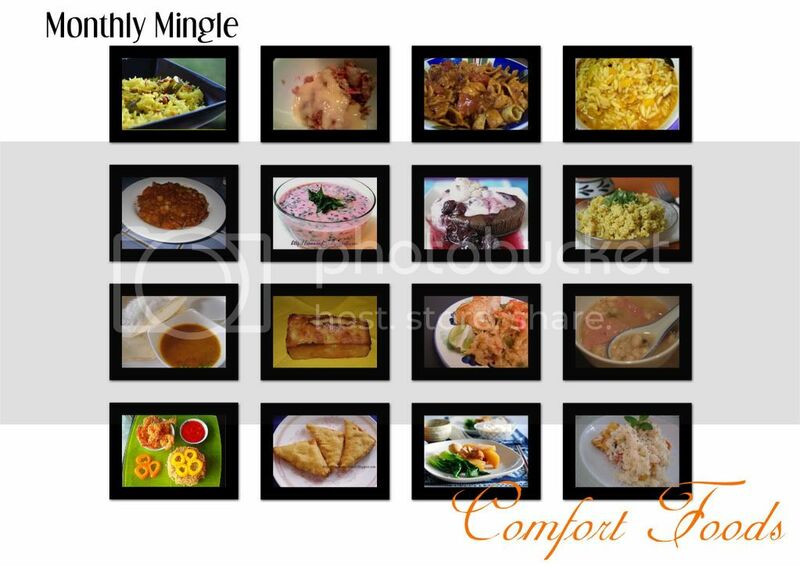 This mingle I am looking for your "One-Dish Dinners." You can let your imagination run wild on this. Make a casserole, use your crockpot or bake it in the oven, the only rule is your entire dinner should come out of ONE pot! Create a dish that fits this theme. Blog about it anytime from now till March 10th, 2008. 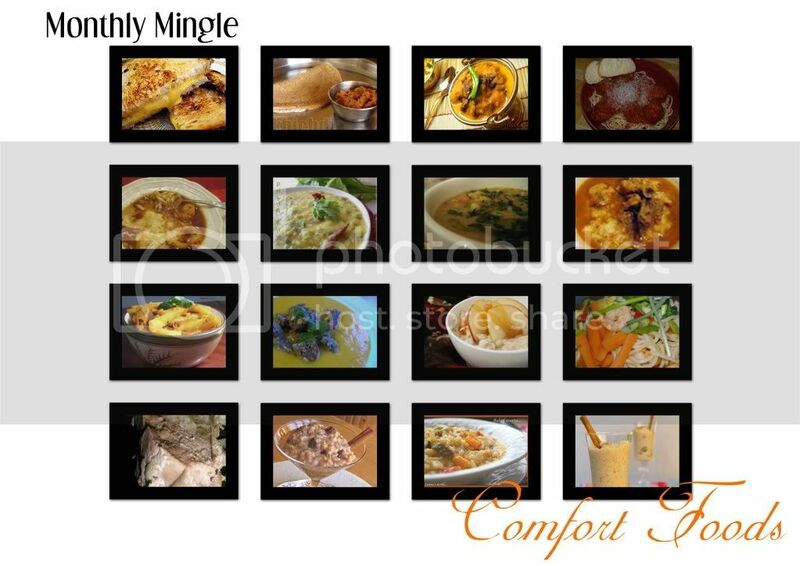 In the subject field of your email please state "Monthly Mingle - One-Dish Dinners"
In your post please include a link to this post and/or the MM logo, so your readers get a chance to mingle with us. Please send only one entry per blog. If you do not have a blog, simply email your entry, with a picture (if you would like me to add a picture) to meetasmingle@gmail.com. Although it's great to get entries from all over the world I have to insist that they be in English. If you have a Blog in another language I would kindly like to request you to post your entries in English as well. Please make note of the new email address for the Monthly Mingle! I'd like to remind those taking part to please check these guidelines carefully and when you send your emails to make sure all the required details are included. Also please check the permalinks you are sending and take a note of the deadline. You will find a comprehensive guideline and event etiquettes for event participation here. Now get ready for some soothing and comforting food! Oh Kitchen, What Won't You Do??? If I've missed your submission send me an email and I'll be glad to update the roundup. If you too have some comfort food and you would like to share with us, add it to the comments section of this post. WOW! Meeta, I have menu planned out for the next 3 months from this post!! That is a tremendous round-up with a some mouth-watering dishes in there. Nice work and I hope you have a good weekend! 90+ entries? wow, there is so much to chose and cook now. thank you for this lovely round-up meeta. Wow, there is WAY too much good food here!! And the photography is beautiful too. I'm got some work to do!! One pot? no problem. Easy and expect many many Kichdis! Can you hear my slow cooker crawling out? Haha!! Wow, 90! Just shows that comfort is prime for everyone. Excellent roundup, Meeta. This is gr8 Meeta, Cool roundup...Thanks for all the work you put in to bring it all in one place.. Bookmarked to try the comfort. Now coming to the new theme, very interesting dear... thought provoking too. Meeta, great round up, too bad I just made soul commforting soup last week, should have sent it over. 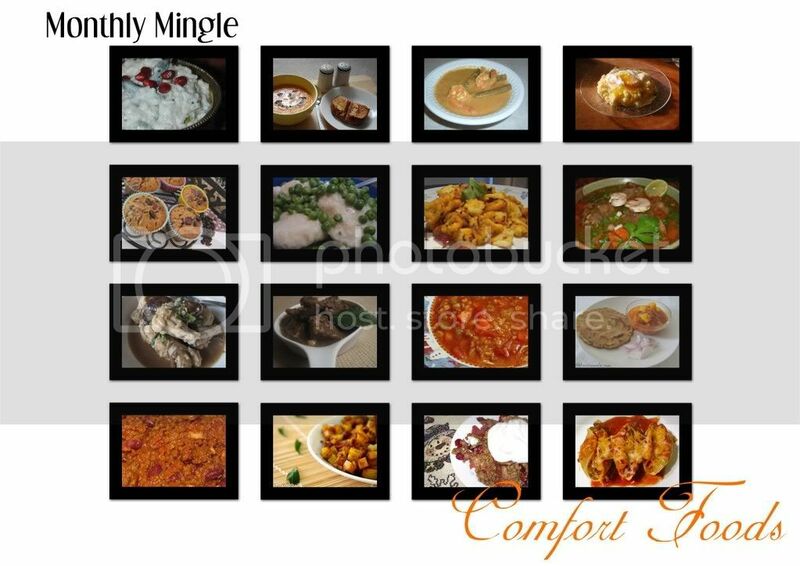 Wow, looks like comfort food is everyone's favorite topic... :) Cool round up as usual Meeta, you are a wonderful hostess... And love the new theme. Thanks so much for hosting this event. Can't wait to try some of those incredible foods! Lovely round up, 90+ eh!! Now I know where to find comfort food recipes!!! Great roundup! And there are so many recipes I want to try, it is dizzying. I'm in for the one-pot meal event this month. Yeah it is indeed outdone this MM. 90 post. I think i will have to droole here for a hour all those delicious comfort food. I have tonnes of recipes and blogs to browse through this weekend, thanks to you Meeta! :) Amazing roundup, and really appreciate your effort! 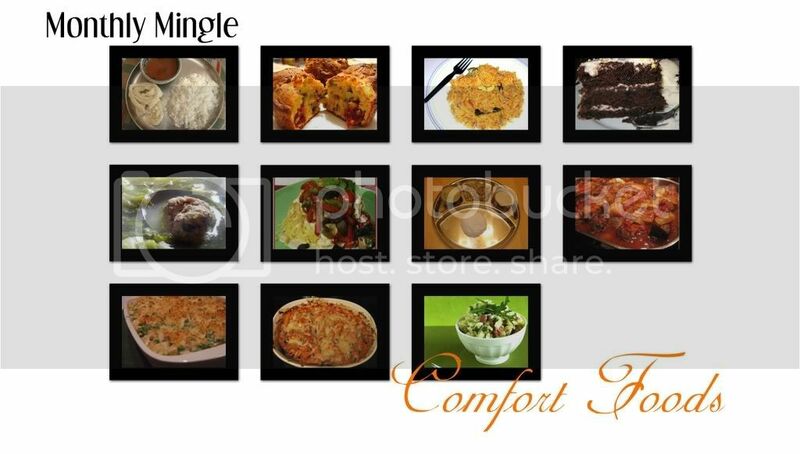 Meeta, What a lovely collection of comfort food recipes. Congratulations on a great round-up, and many thanks! It truly is a grand roundup! I enjoyed putting this one together. I thank you ll for joining me in this mingle! Great job Meeta! I'm very happy to have been a part of your roundup and I've already got some ideas for the next one. Meeta, that was a lovely round up of equally lovely entries...thanks. This is definitely a book-marked keeper. I just have one word to say to this round up! - " B O O K M A R K E D"
Awesome roundup Meeta! Thanks for all the effort and so many wonderful recipes! Great Round Up Meeta! Looks awesome & glad so many participated! that's one hell of a round up...in a fabulous way...some fine pics too...congratulations meeta on the event and the popularity it enjoys...as for me... i failed to send in an entry and i cant tell you how much the round up has made me regret it!! way to go girl!! Wow - so many entries! Obviously everyone appreciates the comfort theme in January!! This is an amazing round-up Meeta. Thanks! What a great turnout! I just love the variety. Thanks so much for all your hard work on this roundup, Meeta! What a well organised round up Meeta, well done! 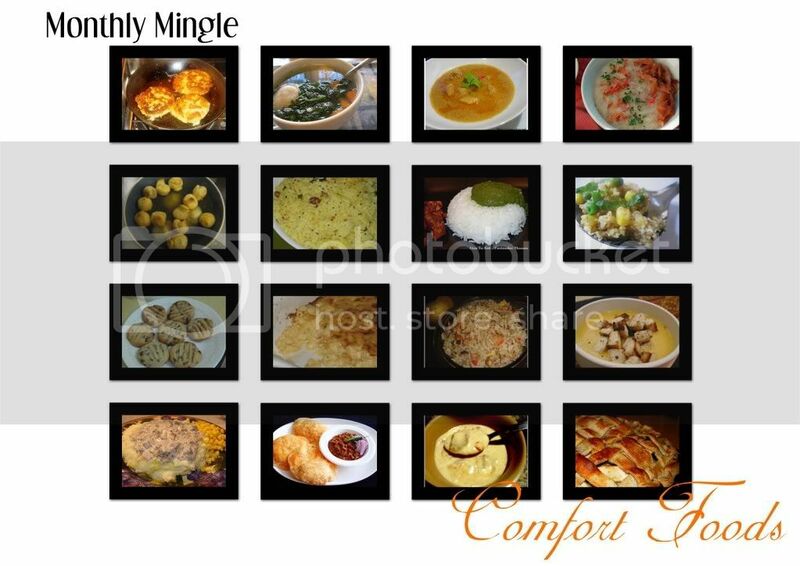 :) Lovely theme for the next Mingle..
Thats quite a roundup. You have done a great job putting it together. I am so looking forward to participating in the next mingle. You're an amazing person -- thanks so much for compiling this roundup! my goodness, talk about comfort food, indeed!! what wonderful entries!! Thanks, Meeta, for this lovely round-up! This is one great collection of comfort foods. This round up is off the chain! I am in love so many of these comfy foods. And the next challenge? I am all about 1-dish meals and its due on my b-day! :) Woohoo! All that comfort food sure makes me want to go put my pajamas back on! Good heavens, what a HUGE number of entries. Thanks so much for posting what turned out to be a huge event! Yum! So many new recipes to try, Meeta! Delicious! So many entries! And they all look great...good job everyone! I have sent you email with my link but maybe your email recognised mine as a spam. I have a question, I notice there is another person has the same blog name, will that be a problem to join in? Just sent in my entry for this month's mingle. Hope you received it. Great roundup.I sent you my entry for this months monthly mingle.Hope u got it. Wow... what a food collection. All the items are so yummy, i love these items. If you provide recipe i think it will be better to all.